A NATIONAL charity dedicated to restoring the graves of every Victoria Cross recipient has been given a substantial donation of tables and chairs to furnish its new museum café. The Victoria Cross Trust, based at Ashworth Barracks near Doncaster, received £3,000 of furniture after making an application to a scheme run by specialist provider Pub Stuff. Café volunteer Dawn Catley wanted to make the café appealing and wrote to Pub Stuff after hearing about its grant programme. She said: “Having achieved a five-star environmental health rating for the kitchen, which was entirely donated, when we saw that Pub Stuff were offering a furniture grant to community groups we felt that our café met the criteria. The Trust launched its military museum with a significant number of donated artefacts as a means of increasing its fundraising efforts. Now it is hoping to boost its coffers further with the opening of the on-site café, which is open to museum visitors and the general public. 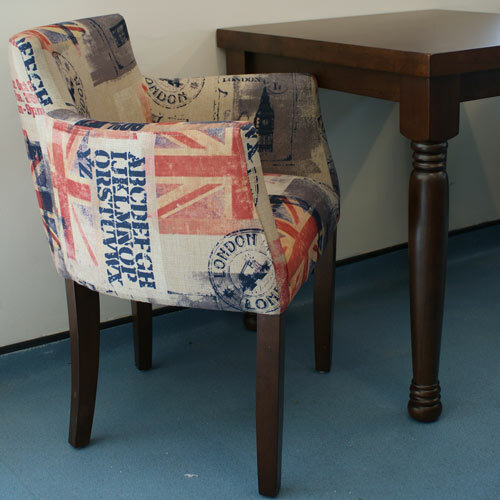 Pub Stuff director Sally Huband had no hesitation in responding positively to the Trust’s application and provided dining chairs in patriot Union Flag fabrics together with a selection of Pub Stuff Highland Grey and Highland Blue contract fabrics. The Victoria Cross Trust preserves and upkeeps every one of more than 1,300 graves of the Servicemen who were awarded the highest military accolade for their bravery.